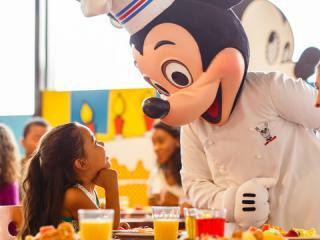 The VIP Character Breakfast includes return transfers from your Orlando hotel or villa by stretched limousine, all-you-can-eat breakfast or brunch at Disney's Contemporary Resort and the chance to meet some of your favourite Disney Characters. The exact time cannot be guaranteed but will be reconfirmed locally 72 hours in advance of your experience. Your exact pick-up time will also be advised at this time. Afterwards, you will be met at and returned to your accommodation or you have the option to use the Disney Monorail System or be taken to Universal CityWalk for easy access to Universal Studios or Universal’s Islands of Adventure. Total duration is around 2.5 hours including 90 minutes for breakfast/brunch.